Does this not shout summertime bliss? The face of childhood innocence is a sweet girl enjoying a ride on the swings. Add an adorable sundress and bonnet and the picture is complete. 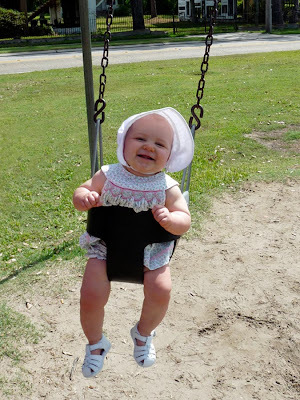 She loves the swings. It is hard to believe her first birthday is fast approaching. What a cutie! She looks so happy. did you make the dress? What a cute pic! I can almost hear her sweet laughter! What a sweet smile! Thanks for sharing. Love the smile, how cute !! ....and the living is easy! She is adorable and so are her dress and bonnet. She looks so very happy!!! Priceless photo of a priceless little baby girl - doubly precious in her handmade clothing. She's beautiful, Martha. She is just the picture of baby bliss. What a cutie pie!